The global automotive electronics market is a competitive one with the presence of a multitude of established players, and the influx of new participants is likely to intensify the competition. Existing players are pouring money into research and development to introduce newer products that will help them sustain the competition. Majorly fuelling the global automotive electronics market are rising safety considerations, demand for high-end electronics for navigation, information, and entertainment, and the rising popularity of electric and hybrid vehicles due to environmental considerations. 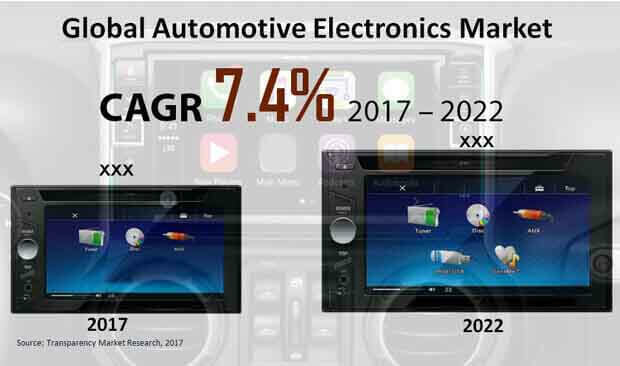 As per a report by Transparency Market Research, the global automotive electronics market will likely clock a CAGR of 7.4% for the forecast period between 2017 and 2022. At this rate, the market which is estimated to be worth US$3,530.7 mn in 2017 will further rise to be valued at US$5,048.9 mn by 2022-end. The worldwide market for automotive electronics has been studied on the basis of a few parameters in this report. By vehicle type, the segments into which the automotive electronics market could be divided are compact passenger cars, mid-sized passenger cars, luxury passenger cars, light commercial vehicles, premium passenger cars, and heavy commercial vehicles. Sales channel segments of the global automotive electronics market include OEM and aftermarket. According to application classification, advanced driver assistance systems, body electronics, entertainment, powertrain, and safety systems are the segments that divide the automotive electronics market in this report. According to application classification, advanced driver assistance systems, body electronics, entertainment, powertrain, and safety systems are the segments into which the worldwide automotive electronics market is divided in this report. Geography-wise, the report takes stock of potential of the worldwide automotive electronics market in the regions of North America, Latin America, Asia Pacific except Japan, Japan, Europe, and the Middle East and Africa. Europe, among all, is expected to lead the overall market in terms of revenue in 2017, and the trend is anticipated to continue over the forecast period. The Europe automotive electronics market is predicted to be worth US$1,265.8 mn by 2022-end expanding at 6.5% CAGR between 2017 and 2022. North America is a key market for automotive electronics. The region is projected to display the leading 8% CAGR between 2017 and 2022 to attain a value of US$1,159.3 mn by the end of the forecast period. Asia Pacific except Japan is anticipated to rise at a CAGR of 7.6% over the forecast period to become worth US$1,256.8 mn by 2022 end. The country of Japan is anticipated to be worth US$259.1 mn by 2022. On the other hand, the Middle East and Africa automotive electronics market is expected to contribute a meagre 9.8% revenue to the overall market by the end of 2017. Going ahead, the region is anticipated to lose 10 basis point (BPS) in its market share between 2017 and 2022. Prominent participants in the global automotive electronics market include Infineon Technologies AG, ON Semiconductor Corp., ST Microelectronics N.V., Maxim Integrated Products Inc., NXP Semiconductor NV, OMRON Corporation, Robert Bosch GmbH, Hitachi Ltd., ZF Friedrichshafen AG, Texas Instruments Inc., ON Semiconductor Corp., and N.V. The report on the global automotive electronics market examines current and future growth trends, and aspires to serve as a reliable business tool for target audience. The analysis presented is for the forecast period of 2017 to 2022, with 2016 as the base year. Data provided in the report for 2015 is for historical reference. The automotive electronics market report includes an elaborate executive summary with a market snapshot that provides information about various segments of the market. It also highlights demand drivers, challenges, and opportunities that are expected to have an impact on the market’s growth over the forecast period. Included in the report is market attractiveness analysis on the basis of geography, and competitive hierarchy, thus presenting a meticulous analysis of the overall competitive scenario of the global automotive electronics market. The study provides a holistic view covering the revenue growth in terms of US$ Mn and volume growth in terms of Mn units over key geographical regions. The objective of this report on the global automotive electronics market is to describe, define, and analyze the market for the forecast period between 2017 and 2022. It looks into opportunities in the market for stockholders and to delineate a competitive landscape of this rising market. Apart from primary research which constitute the bulk of this report, a thorough secondary research was conducted to compute the market size. The report constitutes forecast of revenue generated through the sales channels of OEM and aftermarket in the global automotive electronics market. TMR’S report not only presents forecasts in terms of revenue, but also assesses the market by essential parameters such as Year-on-Year (Y-o-Y) growth. This helps market stakeholders to gauge future opportunities and predictability of the market. Crucial feature of the report is analysis of the global automotive electronics market by vehicle type, sales channel, and application and the corresponding revenue forecast vis-à-vis absolute dollar opportunity. On the basis of vehicle type, the global automotive electronics market has been segmented into compact passenger cars, mid-sized passenger cars, luxury passenger cars, heavy commercial vehicles, premium passenger cars, and light commercial vehicles. Based on sales channel, OEM and aftermarket are the segments that divide the global automotive electronics market. Application-wise, the market has been bifurcated into advanced driver assistance systems, entertainment, safety systems, body electronics, and powertrain. Geography-wise, the report assesses the growth of the worldwide automotive electronics market across the regions of North America, Latin America, Asia Pacific except Japan, Europe, Japan, the Middle East and Africa. Some of the key countries in these regions that contribute substantially to the automotive electronics market are the U.S., Canada, Brazil, Mexico, Argentina, Germany, the U.K., France, Spain, Italy, Nordic, China, India, Malaysia, Thailand, Singapore, Australia, GCC Countries, South Africa, Israel, and Nigeria. The report provides revenue comparison based on vehicle type, sales channel, and application for each of these countries.